"Because the night belongs to lovers," sang punk rocker Patti Smith in her 1978 hit, Because The Night. For six nights this month, Singaporean artist Heman Chong would like the night to belong to lovers too - book lovers, to be precise. His new work - Because, The Night - is a second-hand bookshop he will run for night owls like himself, filled with 50 vital titles that touch on themes such as inequality and violence. The bookshop, presented by TheatreWorks, will occupy the theatre company's premises in Mohamed Sultan Road during the twilight hours from Thursday to Saturday this week and next. "I hope this work will trigger ideas about how we can develop places in Singapore that people might have access to at night," says Chong, 40. "We already have 24-hour gyms, so why not a bookshop that opens late at night so people who love to read can have access to books?" Chong has severe insomnia, for which he has been taking medication since 2013. As such, he usually sleeps at around 5am and wakes at 11am, preferring not to fight his condition, but to spend the wee hours working on his art and writing. An avid reader, his favourite book is the complex, violent door-stopper 2666 (2004), the 898-page swansong of Chilean novelist Roberto Bolano. It is one of the titles that will be sold at the shop, alongside others including The Bluest Eye (1970), Toni Morrison's controversial novel on racism; Alan Moore's dystopian graphic novel V For Vendetta (1988); and feminist essay collection Men Explain Things To Me (2014) by Rebecca Solnit. The list was culled from recommendations by friends and strangers after Chong made an open call on Facebook to discuss the rise of populism around the world. The books, which he amassed from second-hand bookshops across the globe, will be sold at $20 each. Proceeds will be channelled back into TheatreWorks' production fund. "The bookshop is a confluence of many things," says Chong. "It is at once a depository of ideas, but at the same time, a social space in which individuals exchange ways of reading and seeing ideas. So, in a way, (bookshops) are not just markets in which we go and buy stuff, but there is usually a community attached to these places." Publishing editor Shreya Gopi, 27, plans to visit the bookshop, which will open from 10pm to 4am. "Although I like my books new and my lifestyle diurnal, I'm curious to see what this bookshop will look and feel like, and maybe meet the curator-artist too," she says. "The way I approach it would be different from walking into a regular bookshop - I expect this would generate more dialogue and questions." Alongside the bookshop, Chong will also exhibit two sculptural works. 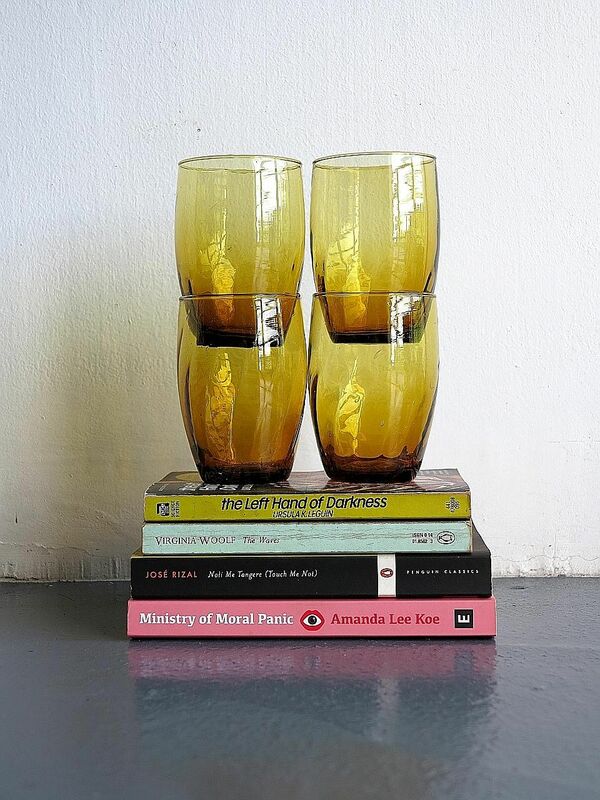 The first, Stacks, is an existing series in which books and glass receptacles such as drinking cups and perfume bottles are stacked in free-standing compositions. The second, a new series called After Hours, features large sculptures that resemble the open-air stalls found in shopping centres or street markets, but bound up in cloth after closing time. Chong is well-known for reinterpreting books through art, such as the Cover (Versions) series he began in 2009, in which he painted imaginary book covers on 45 by 60cm canvases. These have since become prized by collectors. "I am obsessed with artists who are obsessed with writing," he says. "I have a deep curiosity for people who are doing things outside of the profession they are supposed to be specialists in. "As if living a double, sometimes, triple life is the only way these people can make sense of their own existence, as if living one life is just too slow, boring and flat. "All the works I make revolve around the writing of fiction. Even if a thing or a situation seems devoid of any writing, everything I make begins with writing; I would describe the work through words."